Just because you’re away from home doesn’t mean you have to settle for bland accommodations. This spacious, luxurious home is anything but; with room for up to twelve guests, this sunny and expansive space offers a fantastic basecamp for all of your local activities. With high-end contemporary amenities and finishes, including granite benches, stainless steel appliances complete with a double oven, a breakfast bar and dining area with seating for ten, this home is Jackson Hole luxury at its best. Kick back and relax in front of the handcrafted stone wood burning fireplace, or catch up on your favorite show on the flat screen TV. If outdoor relaxation is more your style, enjoy the private deck or outdoor hot tub. With plenty of room for one family or two, you will find yourself looking forward to heading home at the end of each of your snowy or sunny excursions in Jackson Hole. This rental property is professionally managed by Jackson Hole's leading luxury rental company, Apex Real Estate and Property Management. Renters can take comfort that this rental is in excellent condition, very clean, well cared for, with all items operational. Professional pre-cleaning, professional lawn and snow removal services included. Professional hot tub care included. If renters wish to arrange for rental equipment such as skis, cars, shuttle service, baby equipment, housecleaning services, or concierge, all you need to do is pick up the phone and give us a call! We provide complete vacation arrangements if you need. In addition, we are available for 24 hr. emergency response and business hours maintenance. Any questions about the home or area can be handled by one of our property managers. We're just a phone call away! Let Apex Real Estate and Property Management assist you in having all the relaxation you deserve on vacation without the hassle. The Aspens is a great neighborhood for a vacation. Quiet streets and wooded lots, with occasional wildlife sightings in the neighborhood (moose in the back yard!) Just a few minutes walk to tennis courts, athletic club and swimming pool, and the deli/grocery and wine store. About a 5 minute drive to the Jackson Hole Mountain Resort for skiing or summer activities. The West Bank bike trail goes right past the neighborhood; we often ride bikes don to Wilson or to the Mountain Resort in the summer, to enjoy a free concert or ride the tram or gondola. The home is in a lovely setting, with a private sunny yard and deck. The home is large, light and tastefully redecorated. Plenty of room for 1 -2 families. Can't say enough good things about this rental, or the experience with Apex. We were two families renting this house for a winter ski getaway and our kids (ages two and a half to four) - had the best time! We saw moose every day, sledded in the back yard, enjoyed warm fires, had lots of room to play indoors and out, and as adults we loved the hot tub in the evenings! Easy access to town and the mountain. Great set up for cooking and eating in. The Apex team made sure we had everything upon arrival and answered any questions immediately. Highly recommend to any family looking for a getaway, even if we were the fortunate ones to get to play in over 70 inches of snow! 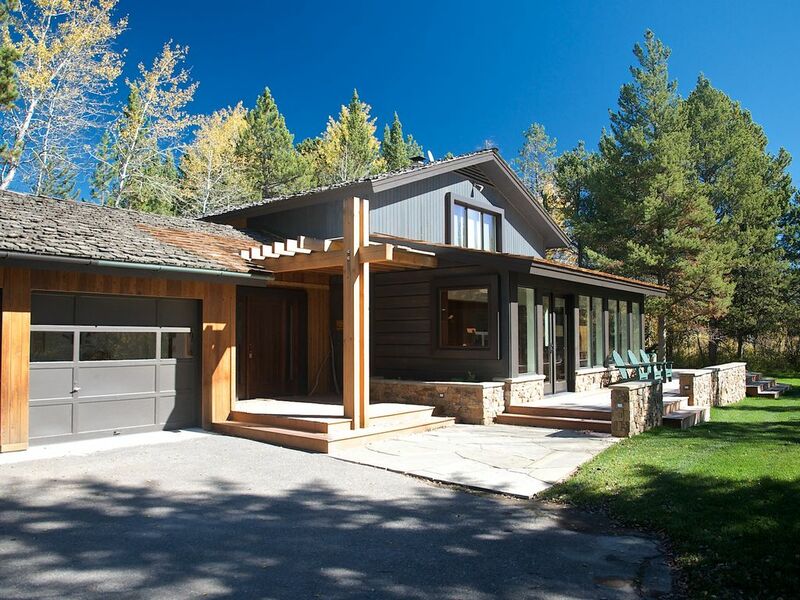 This house offered plenty of indoor and outdoor space for our 9 member family reunion plus the location was perfect for access to the Teton National Park and outside park hiking trails and drives. The house offers a number of bicycles and helmets for riding on the nearby bicycle paths, an outside grill and an outside hot tub. The kitchen is very well stocked with dishes, glassware and cookware. Located within the same housing location is a small store that offers both a wide variety of foods, deli items and wine/liquor. Apex Management is very responsive to requests or concerns and gives quick resolution for maintenance concerns or general feedback. We highly recommend this property and believe it is worth every dollar of rent. We are so happy you enjoyed your stay at Apex Unforgettable Family Vacation. It is a great property for family reunions and multi-generational groups and we are so pleased you enjoyed yourselves. Please come back soon, and when you do, please reach out to Apex because we love to welcome returning guests with a special discount or amenity whenever possible. Thank you again. Well appointed home, convenient to skiing and hiking amenities of Teton Village, as well as the town of Jackson for groceries, shopping, etc. Great yard. We had a female moose and her cub who visited us in the back yard while we were there. They laid down in the yard and stayed awhile while we took pictures from 20 feet away. We enjoyed the wood burning fireplace, there was plenty of wood available. Bikes were available for our use, with bike paths to almost anywhere in the area you would want to go. A few folks in our group rode the bikes to and from the town of Jackson and never had to ride on the highway. Hot tub was perfect for cool nights. Large upstairs living room area with trundle beds makes a great sleeping area for kids and young adults. We will definitely request this house again on any future visits. 4 bedrooms and upstairs living area make this house very comfortable for 10-12 people. We are so happy you enjoyed your stay at Apex Unforgettable Family Vacation, which is a great property for large groups. We're also happy you saw wildlife and hope you were completely safe inside since moose can get upset quickly and charge before you know it! Please come back soon, and when you do, please reach out to Apex so we may welcome you back with a special discount or amenity, which we love to do for returning guests. Thank you again! The overall experience was terrific and even better than expected. The weather was great. There was an issue with the air conditioner. I notified Apex, they were very responsive and had the issue resolved within one hour. We will certainly return in the future. We had 11 guys staying in the house and it was great. We are so happy you and your group enjoyed your stay at Unforgettable Family Vacation! It's a great house for large groups where everyone can gather and enjoy individual space as well. Please come back soon! This home is in the desirable Aspens Subdivision, just minutes from the base of Jackson Hole Ski area in Teton Village. Close to all of the shopping, dinning, spas and ski shops of Teton Village without the traffic of tourism lodging in Teton Village. Streams, big views and natural forest surrounds the neighborhood and is home to a host of wildlife including Moose, Mule Deer, and Elk. The views from this area are 180degrees of the Gros Ventre Mountains, The Valley and the slopes of the Jackson Hole Ski area and the National Parks lands in boaders. The Aspens Subdivision is 4 miles from Teton Village and 5 miles from Town of Jackson. This location lends itself to being able to take advantage of all the area has to offer without being in the noise and hustle and bustle of Town or Village. The home is also 5.5 miles from the Southern entrance to Grand Teton National Park, and the access road ( Mosse To Village rd) is a great place to view bears in the fall and Elk anytime of the year.